Once reserved for venues equipped with special ovens, wood fired pizza is now possible in any oven by using Authentic Wood Fired Crusts, available only from Alive & Kickin’ Pizza Crust. Maximize their existing kitchen equipment to delight customers and drive sales — no special oven required for final bake! 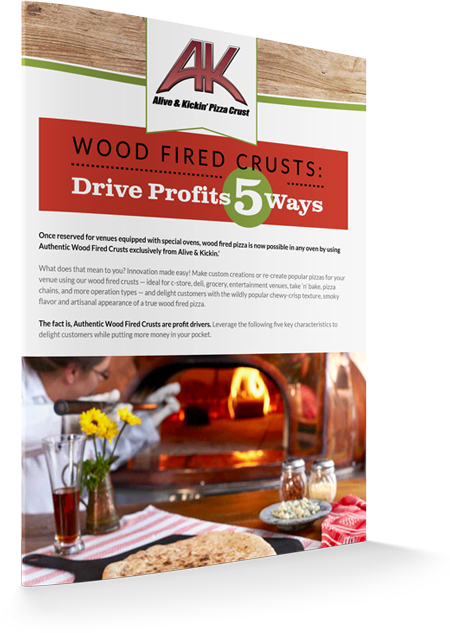 Get (wood) fired up about Authentic Wood Fired Crusts from Alive & Kickin’ Pizza Crust! Simply fill out the form to access your copy of this valuable tip sheet now.